Alfa Laval is an international company with a global presence. Diversity and inclusion are key priorities and the aim is that the composition of employees reflect the geographic markets where we operate. Alfa Laval's vision is to create an inclusive workplace where diversity is essential in helping to achieve company objectives and maximize the potential of individuals and the organization as a whole. Alfa Laval is present in over 100 countries and have 17 nationalities represented within the senior management and 100 nationalities within the Group. We have ongoing initiatives that focus on diversity, one is the project "Diversity Challenge" where candidates with different backgrounds gets the opportunity to gain valuable experience from each other. Alfa Laval's "Diversity for growth" strategy include equal career opportunities to support women in their career development within the company and to create a dynamic and diverse working environment to sustain successful business. One initiative within this strategy is the Development and mentorship programme called Impact. The purpose of the programme is to identify, retain and develop emerging female leaders within Alfa Laval in order to increase the number of management positions held by women. Impact offers a mix of training and coaching sessions built on development areas identified by the participants. In total, 43 females have participated in the programme and the results show that 70% of the participants have new positions one year after the programme ended. Alfa Laval has decreased the gap between the proportion of female managers and employees. In 2009, the proportion of female leaders within the group was 15 percent with the goal to reach 20 percent. 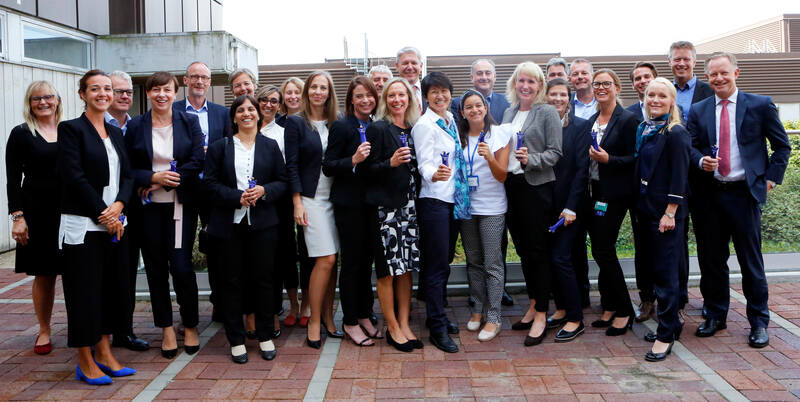 Today, Alfa Laval has reached the goal of 20 percent female managers which also mirrors the proportion of females in the whole group. Elna Persson; Program Manager, Christina Lisbona, Joakim Thölin, Malgorzata Moczynska, Joakim Vilson, Hemlata Joglekar, Susanne Phalen Åklundh, Sara Billo, Ekaterina Akulina, Evgenia Kuchuk, Tracey Putnam, Stefan Hansson, Linda Karlsson, Casper Andersen, Belinda Lau, Juanita Ramírez, Alex Syed, Anna Wenemark, Lina Florwald, Sammy Hulpiau, Mikael Tydén, Anita Byskov, Julien Gennetier, Minna Westerlund; External consultant & facilitator/trainer (Generact), Thomas Möller, Lars Dithmer.